Dual functions stereo music/audio transmitter or receiver to transmit or receive music wirelessly between TV, home theater systems, Amazon Fire TV, Echo Dot, Apple TV, blu-ray player, cable/sat box, iPads, iPhones, Galaxy, Android, MP3, Bluetooth headphones, speakers, soundbars and audio receivers via A2DP profile. Long range RF up to 50 meters (165 feet) covers the most of your house and backyard area with HD audio reception. HDMI, HDMI (ARC), optical (Toslink) digital audio and aux audio interface provided HD sound quality. 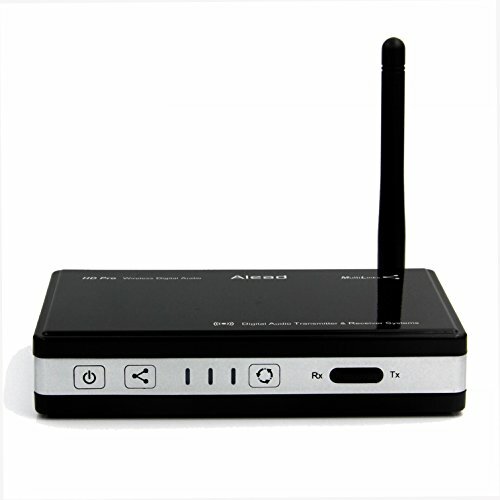 HDMI audio extraction*, digital/analog audio converting, HDMI (ARC), audio pass through, and HDMI A/V pass through provides additional audio and video output from to other devices. Multi links connects two Bluetooth devices at the same time to enjoy sharing music with multiple devices. In transmitter mode, audio is transmitted from audio source device such as TV, home theater to Bluetooth stereo speaker, soundbar, headphone or stereo receiver. In receiver mode, audio/ music is received from iPads, iPhones, Galaxy, Android, Bluetooth MP3 player...etc to home theaters, speakers, and soundbar. The low latency audio can minimize lip-sync and audio lag. Note 1. Users can use two TRX HD Pro to have a completed low latency set. Package includes : Bluetooth HD Pro Transceiver, Bluetooth antenna, QSG, Optical (Toslink) cable, Mini optical adapter, USB power cable and A/C adapter. Note 1: TRX HD Pro extracts digital PCM stereo audio signal from HDMI input. It does not support DTS, Dolby Digital or 5.1 and beyond. Note 2: It has audio delay caused by Bluetooth technology. If you have any questions about this product by Alead, contact us by completing and submitting the form below. If you are looking for a specif part number, please include it with your message.